the World: The Story of Aristotle Onassis . Awards: Best Supporting Actor Academy Award, for Viva Zapata! , 1952; Best Supporting Actor Academy Award, for Lust for Life , 1956. Agent: Johnnie Planco, William Morris Agency, 1350 Avenue of the Americas, New York, NY 10019, U.S.A. The Original Sin, a Self-Portrait (autobiography), New York, 1972. One Man Tango , with Daniel Paisner, New York, 1995. "The Loving World of Anthony Quinn," interview with Mary Simons, in Look (New York), 1 April 1969. "Competing with Myself," interview in Films and Filming (London), February 1970. Interview by Veronica Webb, in Interview (New York), May 1991. "The Number It Takes to Tango," interview with Alex Witchel, in New York Times , 6 July 1995. Marill, Alvin H., The Films of Anthony Quinn , Secaucus, New Jersey, 1975. Ball, Gregor, Anthony Quinn: seine Filme, sein Leben , Munich, 1985. Amdur, Melissa, Anthony Quinn , New York, 1993. Current Biography 1957 , New York, 1957. Johnson, Ian, "Anthony Quinn," in Films and Filming (London), February 1962. Marill, Alvin H., "Anthony Quinn," in Films in Review (New York), October 1968. Denby, David, "High on Anthony Quinn," in Premiere (New York), September 1992. Nielsen, Ray, "Anthony Quinn," in Classic Images (Muscatine), August 1993. Williamson, K., "The Mighty Quinn," in Boxoffice (Chicago), January 1995. Pounding on his beefy chest and rolling his exotic eyes, Anthony Quinn is easily disparaged as an all-purpose Ethnic, but his vibrant approach to acting can be riveting. In the 1990s, in smaller doses, as in the macho shenanigans of Last Action Hero , the formulaic but diverting comedy of Only the Lonely , and especially the swooning lyricism of A Walk in the Clouds , Quinn seems looser and less pointedly vociferous. Maybe time has purified him of some of that much talked-about Life Force, that so memorably defined the spirit of Zorba the Greek . That was before it degenerated into meaninglessness when applied across the board to all the international characterizations that nipped at Zorba's heels. In his post-1964 heyday, Quinn was as overexposed as the cast of television's Friends are today. Born in poverty in Mexico, Anthony Quinn served a long contractual apprenticeship in the movies as lummox-in-loincloth or scourge-with-scimitar. If menace of a foreign extraction was required, casting agents made a beeline to Tony. But small monotonous parts were as galling to Quinn as being dismissed as Cecil B. DeMille's son-in-law. Graduating from leads in B movies, Quinn remained the same stone-faced heavy in A pictures; the performance in Viva Zapata! that won him his first Oscar hardly seemed more challenging than dozens of scenery-chewing turns that preceded it. Instead of turning his frustration at being typecast inward, Quinn started thesping his heart out more and more; the Quinn style was born—earthy, hearty, and above all, voluble. You could outfight Quinn but never outshout him. Several savvy breaks from the Hollywood rut paid off by building (maybe overbuilding) Quinn's confidence. After donning the Brando T-shirt as a replacement Stanley Kowalski, he also shared glory with Olivier himself as they switched lead roles in Becket , and then his career rose phoenixlike out of a past-his-prime graveyard with Fellini's La strada . Taken seriously by Hollywood thanks to his art-house circuit success as the brutal strongman, Zampano, Quinn snagged a second supporting Oscar for Lust for Life and then began stamping all his roles with the same lust for overacting. Whether certain directors could handle him with more authority or whether he simply responded to simpatico material, Quinn got delightfully high on his own ego-puffery in Cukor's colorful Heller in Pink Tights , presented a memorably noncondescending portrayal of an Eskimo in Ray's The Savage Innocents , then shadow-boxed beautifully with despair in Requiem for a Heavyweight , a much subtler and affecting portrait of brute force than his La strada stint. 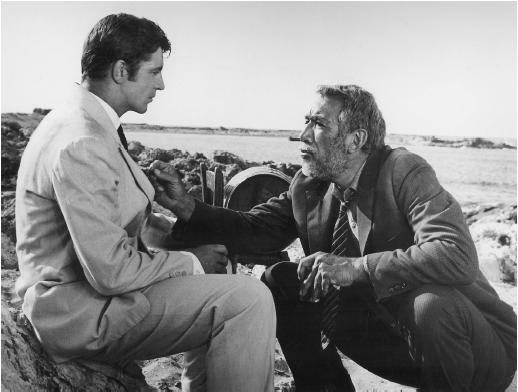 Throughout the 1950s and early 1960s, whether top-billed as he gave us Barabbas or cameoed in Lawrence of Arabia , Quinn broke no new ground until the soulmate role of Zorba the Greek liberated him. After 1964, however, Tony the Quinn became Zorba the Greek, and it is difficult to rebut the prevailing wisdom that dubbed him a one-man UN. He could play Italian, Native American, Greek, or Basque—just go round the globe; Quinn acted there. This was thesping by way of Berlitz. Still, if there were many occasions when you wished he had moved on from Esperanto-translated populism, there was no denying this peacock actor's energy. If every performer seeks to improve upon reality, then Quinn is the Great Embellisher. Refusing to play in sotto voce, the man is a one-tenor opera. The feverish, life-forced quality of his performances (good and bad) sing out with the overabundant grace notes of a man whose love of acting is boundless.